Alexander Skarsgard (Big Little Lies, True Blood) and Jesse Eisenberg (Zombieland, Now You See Me) team up to play cousins in the dramatic thriller, The Hummingbird Project. The Orchard’s just unveiled the official poster and trailer for the 2019 theatrical release from writer/director Kim Nguyen (Eye on Juliet) which finds Skarsgard sporting a new look. In addition to Skarsgard and Eisenberg, the cast also features Salma Hayek (How to Be a Latin Lover) and Michael Mando (Better Call Saul). Writer/director Kim Nguyen’s behind the scenes team includes director of photography Nicolas Bolduc, editors Nicolas Chaudeurge and Arthur Tarnowski, production designer Emmanuel Frechette, and costume designer Valérie Levesque. 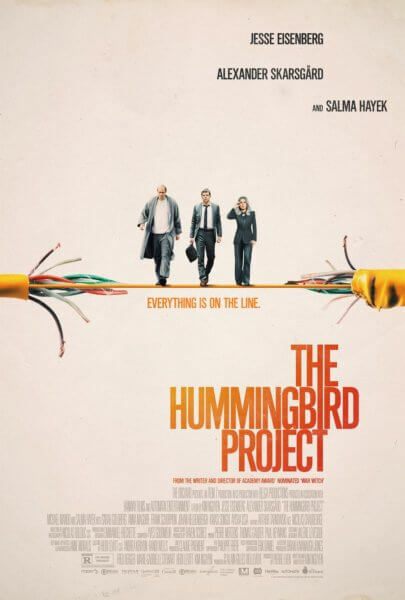 The Orchard is planning on releasing The Hummingbird Project in theaters on March 15, 2019. In this modern epic, Kim Nguyen exposes the ruthless edge of our increasingly digital world. Cousins from New York, Vincent (Jesse Eisenberg) and Anton (Alexander Skarsgård) are players in the high-stakes game of High-Frequency Trading, where winning is measured in milliseconds. Their dream? To build a straight fiber-optic cable line between Kansas and New Jersey, making them millions. But nothing is straightforward for this flawed pair. Anton is the brains, Vincent is the hustler, and together they push each other and everyone around them to the breaking point with their quixotic adventure. Constantly breathing down their necks is their old boss Eva Torres (Salma Hayek), a powerful, intoxicating and manipulative trader who will stop at nothing to come between them and beat them at their own game. Poster for ‘The Hummingbird Project’ starring Alexander Skarsgard, Jesse Eisenberg and Salma Hayek. Next Article ‘Riverdale’ Season 3 Episode 10 Photos: Is Archie Really Dead?